On a steamy summer’s night, the sounds and smells are of Africa. Hawkers grill meat on fires built inside shopping trolleys. Others sell corn, which pops on the flames. People jostle and sweat; thick smoke hangs in the air. West African women — les Reines de Marchand, the Queens of the Market — sell fake designer clothes. Hustlers in sunglasses work the crowds. ‘Burrha! Burrha!,’ they shout, holding bags of counterfeit Marlboro cigarettes. Some voices are from sub-Saharan Africa — Ivory Coast, Nigeria, Sudan, Eritrea, Congo, Guinea, Sierra Leone. Afghans shout and joke in Pashtun; others speak in languages I have not heard before. There are thousands at this open market — haggling, eating and drinking. At the World Express cafe, groups of men argue in Arabic. On side streets, men smoke shisha pipes and talk — again, in Arabic — on every corner. Women shop in veils and scarves, always accompanied by a male relative. Yet this is not an exotic, far-flung destination. This is France. Moreover, this is Paris and only six miles from the Eiffel Tower. The reason for all this activity — in an area which even the most optimistic estate agent would struggle to sell as ‘cosmopolitan and bohemian’ — is quite simple: immigration on a mammoth scale. The area in question is called Saint-Denis in the north-east of the city, where the Basilica holds the resting places of many French kings and queens. Recently, it was reported that this sprawling district now holds as many as 300,000 illegal immigrants, many of whom rely on crime or the ‘black economy’ to make money. The official legal population in Saint-Denis is estimated at 1.5 million. Not only that, according to French parliamentarians in a new report that’s causing much anguish across the nation, as many as 420,000 legal residents here are living ‘below the official poverty line’. The scale of the problem grows each day. An estimated 80 migrants arrive in Paris every 24 hours — 550 a week. Many head for Saint-Denis because of its closeness to transport links, including the railway lines heading towards the North coast, and Britain. 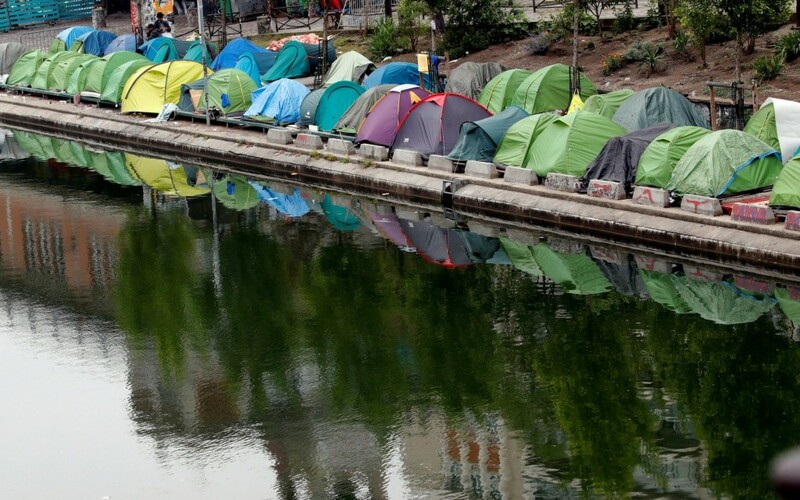 Migrant camps, set up in tents along the Seine in this area of Paris, were destroyed by the police in May, with the occupants who didn’t get away taken for processing in detention centres after a raid. But there are still campers everywhere, as well as people sleeping on the streets. 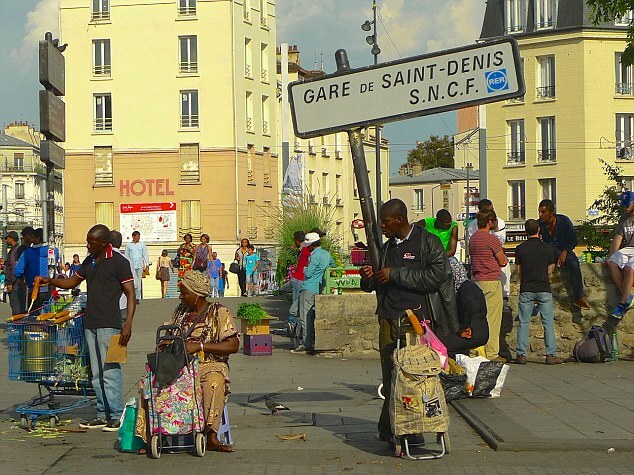 There are an estimated 135 different nationalities in Saint-Denis, most extremely poor, including an estimated 600,000 Muslims from North African or sub-Saharan African backgrounds. Bon chance, monsieur — as they don’t say in this teeming quarter, where speaking Arabic is more useful than French. Having spent several days in Saint-Denis, it’s clear to me that the area is already lost to France — to the rule of French law, equality, religious freedom, and even access to the streets by the police themselves. Here, I saw a woman walking in full-face veil — illegal under a French law introduced to promote integration. No one batted an eye. People bought and sold drugs openly. What law there is takes place inside Sharia courts, where Islamic leaders dispense the same forms of justice practised in the countries from which many here fled. And where, as I discovered, other faiths and religions are being driven from the area. When helicopters flew overhead in training for the Bastille Day celebrations earlier this month, one man pretended to shoot at them with a machine gun. Another pushed him away and pretended to fire a shoulder-mounted missile, tracing the missile with his hand towards its targets and shouting: ‘Boom!’ Everyone laughed. Further down the street, there was a flurry of activity. A woman was surrounded as she opened a huge bag full of phones, shoes, sunglasses and handbags — clearly stolen from tourists or Parisians. The goods were quickly sold and the crowd melted away. Police have reportedly admitted the area is a ‘no-go’ zone, and will only drive through the areas armed and four to a vehicle. Meanwhile, politicians on the Left try to deny the problems: Anne Hidalgo, Socialist Mayor of Paris, announced she was going to sue Fox News, the Trump-supporting Right-wing U.S. TV channel, for claiming that there were ‘no-go areas’ open only to Muslims. The suit was never filed, but it is surely impossible to deny that the number of impoverished migrants in France is causing a dangerous social dislocation. The appalling attacks in November 2015 by home-grown Islamic State killers shone a pitiless spotlight on the problems that can grow out of immigrant ghettos. 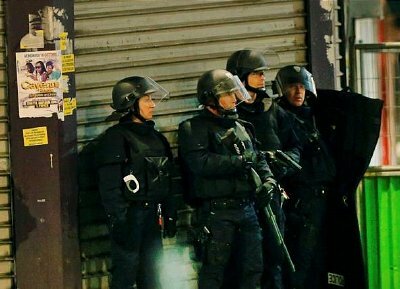 The carnage started close to the Stade de France, the national sports stadium, which is in Saint-Denis, where some of the killers sought refuge after the attacks. One hundred and thirty people died in a single night of violence involving suicide bombings and Kalashnikov fire around bars, cafés and venues, including the Bataclan concert hall. Five days after the attacks, the suspected mastermind was run to ground in an apartment by hundreds of security officers. ‘The police had no idea who anyone was, and were pretty much shooting on sight because everyone was a suspect,’ a local who witnessed the raid told me. At the time, Manuel Valls, the prime minister, spoke of a ‘geographical, social and ethnic apartheid’ and that ‘these last few days have underlined a lot of evil that is gnawing at our country’. The 2016 Bastille Day attack in Nice left 87 dead — including the terrorist — and 458 injured, when a truck ploughed into revellers on the Promenade des Anglais. Since then, as I discovered, in many ways the situation has worsened, although thankfully there has not been another major terrorist attack. There are around 350 known jihadists living in Saint-Denis, while 1,700 are believed to have returned to France after fighting for IS in Syria, with 15,000 terrorism suspects in France. In Saint-Denis itself, there is a record number of mosques — 160 official ones, and many more unofficial — compared with 117 Catholic churches and 60 Protestant. Yet it is the unauthorised mosques — set up in basements and garages — that the authorities fear the most. ‘The radicalisers use these hidden places of worship to influence the young and impressionable,’ said a veteran police officer who has worked in Saint-Denis for more than two decades. Much of the money-raising activity comes from drug-dealing by gangs, many of them Muslim. At one high-rise block of flats not far from where I was staying, the scale of the operation was evident. Like a department store, different drugs are sold on different floors. Moroccans and North Africans sell hashish for ten euros a bag on the third floor. On the next floor up, two West African youths — one with his hair dyed pink, the other blonde — were dispensing skunk marijuana for 20 euros a bag. Further up were older black Africans selling rocks of cocaine at 20 euros for a small plastic wrap. Above, heroin was being sold, and there was also, apparently, a room set aside for injecting. At this point, I told one of the men I was a journalist and asked whether we could have a chat. A chunky character in a red Ellesse sports shirt, he was relaxed, smiled at me and said politely to me in English: ‘No — go.’ I went. Most blocks seemed to have the same operation, with youths guarding the front doors, ‘spotters’ on the streets opposite for signs of police or other gangs, and the drugs held and sold inside. Rabbi Yisroel Belinow, 50, is either a fool or very brave. As I walked near a mosque, I saw him looking out of his window. His home was firebombed in 2009, and a kosher restaurant next door burned down. He’s since watched other Jews flee the area, and his dying father begged him to leave before it was too late. He came down to speak to me but declined my invitation to stroll around the streets. ‘The problem is people coming to France and wanting to change it. And it’s worse because they want to force people to change. I know I look different. The hatred is obvious — people spit when you walk past. ‘I respect this country because I was born here. I respect the laws of this country. I respect Christmas even though it has nothing to do with being a Jew. ‘Now they won’t let Christmas happen. France has existed for thousands of years. If I didn’t like those laws, I would move to another country. Mireille Knoll, an 85-year-old Jewish grandmother and Holocaust survivor, vowed never to leave Paris, but she was stabbed to death in her apartment in March. Two men in their 20s have been charged with her murder, one of whom Mrs Knoll’s family say was a Muslim neighbour they had known since he was a boy. While only a few hundred attend weekly mass at the Basilica here, thousands of Muslims stream into the area’s mosques for Friday prayers — so much so that, in a rare intervention, the authorities banned them from praying in the streets as well. Women suffer the most. Not far from the drug dealers outside the station, I visited a women’s refuge set up by Ghada Hatem, a senior gynaecologist, who says almost one in five of her patients have been victims of female genital mutilation (FGM) — the barbaric ritual of cutting the sexual organs of young women. Now a specialist in the repair of such intimate mutilation, Hatem, who hails from Lebanon, says she is in daily contact with ‘women who tell me about the horrors they experience at home’. All this, of course, has led to a toxic, incendiary atmosphere in this Parisian suburb — with Muslim groups countering that they suffer harassment, police violence and religious and racial discrimination. Riots erupted in February last year after a young black man was allegedly sexually assaulted with a baton by police officers. Yasser Louati of CCIF (Group Combating Islamophobia in France) said attacks and harassment of innocent Muslim communities had ‘risen considerably since the terrorist attacks’, even though many of the victims of the 2015 Paris outrage were Muslims. Mosques have been firebombed, and Muslim centres daubed with pigs’ blood. New powers for the security services make house searches and arrest easier, especially when suspects are targeted because of their ‘physical [Arab] appearance’, said Mr Louati. The influx of migrants into Saint-Denis has been made worse because of a crackdown at Calais which has seen the infamous Jungle camp — used by migrants as a base to try to reach England — demolished and thousands of inmates dispersed. One group, I met comprised migrants trying to reach Britain who told me they were originally from countries such as Pakistan, Bangladesh and Ghana, which may be troubled but are hardly war-torn. I also met men from Afghanistan. So what can be done? Extreme circumstances have prompted extreme responses, with one French intellectual, Professor Christian Moliner, even suggesting a parallel Muslim state should effectively exist in France, so that any Muslims who wished to do so could follow sharia law, in order to prevent civil disturbances. He said that if this did not come about, there could be a civil war in France. Moliner, an author on Islam, stated: ‘We can never convert the 30 per cent of Muslims who demand the introduction of sharia law to the merits of our democracy and secularism. Even Left-wingers belatedly acknowledge the scale of the problem. Veteran politician Jean-Louis Borloo, a former minister, was this year tasked by President Macron to research and write a report on the burgeoning problem of the Parisian suburbs. As well as recommending that €5 billion be spent, he stressed the need for ‘national reconciliation’, especially in districts facing up to the withdrawal of French identity and community, which in turn fuels xenophobia. Having had the good fortune to spend much of my working life reporting from around the world, and Africa in particular, I adore melting pots of different cultures, languages and races. And I have almost always been treated with kindness and respect in Muslim countries. Yet, frankly, the time I spent in Paris has convinced me of the difficulty of achieving genuine integration between these defiant, troubled inner-city Muslim communities and mainstream French society. Indeed, the only person to shake my hand during my visit was the rabbi. Everyone else offered me their wrist, not wanting to touch hands with an infidel — someone unclean. As a metaphor for what is happening in the French capital, it couldn’t be more sad — or more troubling.